deep dive Q&A to lay the foundation of our website project together. YOUR BEAUTIFUL (NEW) WEBSITE IS AROUND THE CORNER. 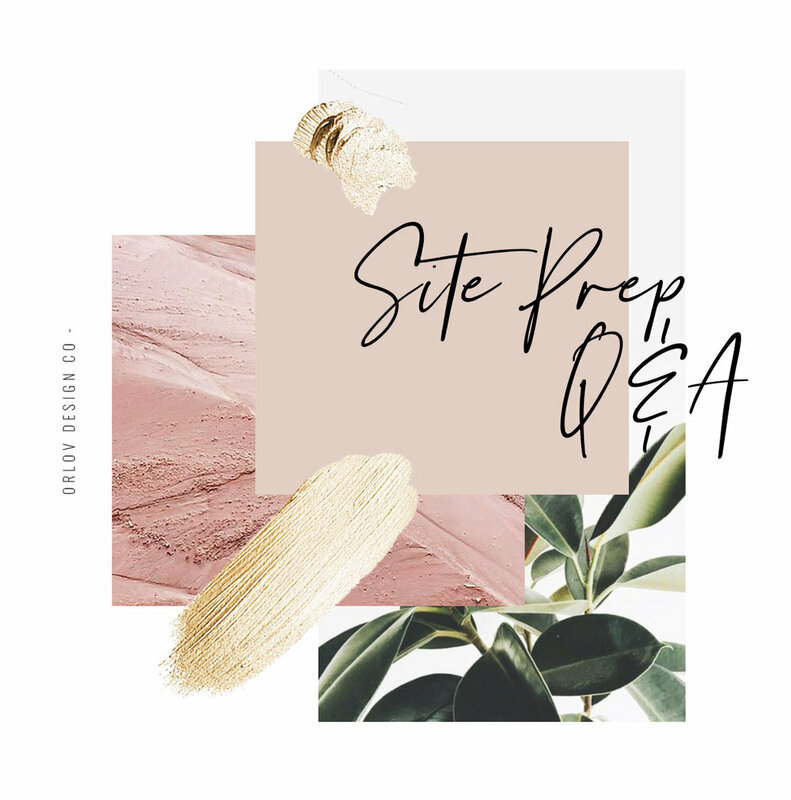 This Q&A is for you to share a lot more details about your business, your operations and your goals. It will become the foundation for how we design your website so your demographic can connect with you in a meaningful way. And you can book this jobs or sell your products. Please read though the next sections and then fill out the entire form below. The more info you share, the better! Now that you've taken the exciting step towards reimagining your company's brand voice, website and visual story, let's learn more about what your professional vision is, what you love, what you value, what your 2019 business goals are & what inspires you. To prepare for our collaboration, we want to learn more about your brand's visual narrative (think the "emotional" experience that people will have when they visit and explore your site.) as well what your goals and paths to success are. This will provide us the best information so we can art direct your website in a strategic and meaningful way to get your specific customer & client community. Whether you are doing our subscription plans (Standard & Standard+) or our advanced website design plan (Styled), we work with you to design and build a compelling website tool. As we dive into Phase 1 (wireframe), we will determine the UX (user experience) of your site. i.e. how people will get around your website from Point A to Point B and so on. Everything from the navigation bar's content to the art direction of each page to how your social media links flow to what your footer is comprised of, etc. We will also select your brand toolkit components that will be integrated throughout your site and your platform…the sitewide font palette, color palette, graphic lockups, key visual placements, etc. All of this comes together to create a 360 snapshot of your brand. Below, please review and answer every question. Keep in mind nothing is really set in stone. We can certainly evolve and restyle your website experience the project comes together. THIS IS A GENERAL POV ON WHAT YOU ARE LEANING TOWARDS - NOT SET IN STONE AS THE EXACT PALETTES. WE CAN USE YOUR SELECTS AS A CONVERSATION STARTING POINT. PROVIDE AS MUCH DETAIL. THE IDEA IS TO HAVE A ROBUST UNDERSTANDING OF YOUR BUSINESS GOALS, TARGET AUDIENCE AND VISION SO WE CAN STRATEGICALLY DESIGN A COMPELLING SITE GEARED TOWARDS YOUR CLIENT BASE. select your fave font combo. AND IDEAS FOR COMBING SERIF & SANS SERIF FONTS AS WELL AS FONT WEIGHT. You would like your site to have parallax vertical scrolling with layered images and blocks as site visitors go up or down. They can see key information without clicking to a new page or click through the nav bar. You would like for your site to have a horizontal, or landscape, scrolling experience for site visitors. They can go left or right to see key information, large imagers and content without clicking to a new page. You would like for your site to be essentially one strong lead image, allowing the site visitor to click through the navigation bar and/or square block content to where they would like to go to next. This is a general list of assets that we will need to build out your new website. Take time to gather all of the relevant pieces and upload them to our shared Dropbox. Use our Google Doc to place your Copy. Pls include section titles such as About Us, Our Services, etc. Really think about how you want your portfolio/project page to highlight your images. Squarespace provides several layout options. PLEASE ANSWER ALL QUESTIONS IN ONE SESSION & SUBMIT. Who are you? What do you do? Why are you unique? This is your Target Audience. Define you demographic including Gender, Age range, Financial Bracket, Education level, etc. Please list three adjectives that describe her/his personality. LIST 3 WORDS THAT DESCRIBE YOUR BUSINESS STYLE? These are attributes such as creative, serious, savvy, etc. What was this initial spark? What was your initial business goal and how has this evolved? DESCRIBE YOUR FAVORITE PROJECT OR PRODUCT SALE? Why was it so great? What was your reward? What was your client's or customer's reward? WHAT IS THE STATE OF YOUR BUSINESS RIGHT NOW? List a few challenges and/or goals you have recently observed. What are you looking to accomplish with your new website? Share you key objectives for the year, per quarter or even per month. For example, are your goals to launch your service or product? scale your business? add more employees? evolve your brand? get more clients? do more projects? Add more products? Work less? Work more? Share Pinterest URLs that show the style, color, vibe, you name it that embody your company POV and style. For example, colors, styled, fonts, layout, the style of the site and the flow. For example, copy and messaging that resonates with you or how the navigation bar is showcased, etc. Do you have the components of your business outlined and ready to go for the site? For example, your copy - About Your Company bio, your Services, your Rates, your Mission Statement, your social media platforms, etc.) Do you also have your photos selected, edited and ready? Pls note your answers from the style questions above. Please keep in mind these are general ideas of how we will develop the site - nothing is set in stone. As we build the website, the style, content and UX will evolve. Pick one style that you like.